I have a confession to make, y'all. I have been a lazy blogger! I keep making things, or cooking, and taking all sorts of pictures, but NEVER post about them! There was even a birthday party that I failed to post about! ::Hides face in shame:: Yuuuup, I've been holding out on you guys! How awful of me! No more! I promise! WARNING! THIS POST IS EXTREMELY WORDY AND PICTURE HEAVY! A few months ago, I celebrated my 29th birthday. (Yes, I KNOW, I'm young, only 29, a baby...blah blah blah...) I decided the theme for it should be a grown up version of Alice in Wonderland! Now, before you ask me why I theme my adult get-togethers, I must defend myself. 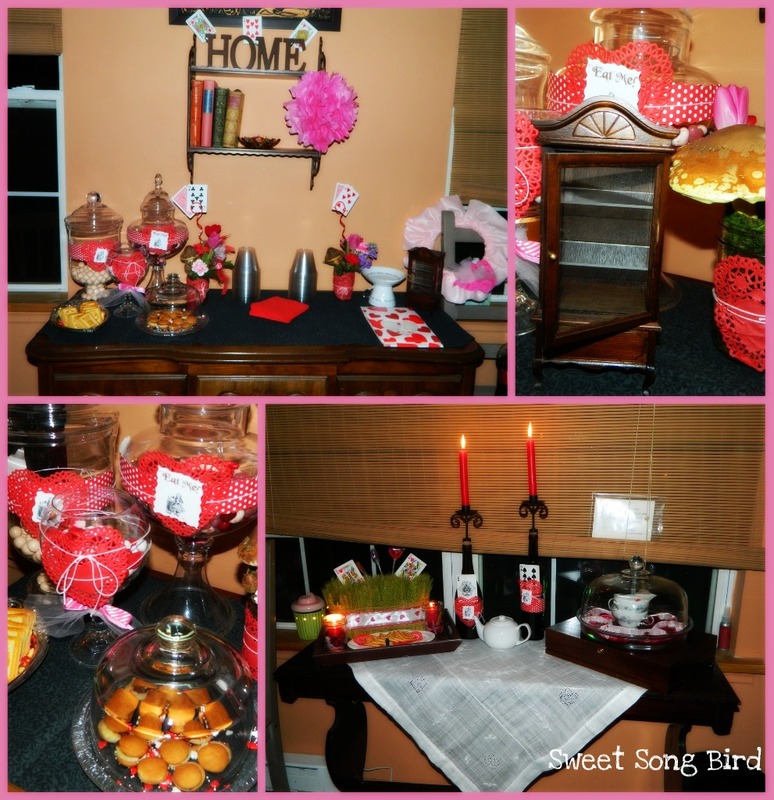 I absolutely LOVE transforming a party space into something completely whimsical and unexpected. Adult birthday parties should be fun too! I'm not saying, let's play pin the tail on the donkey, but why NOT fully immerse yourself in the experience!? Ok, I'm done. Back to my blog post. My birthday is a few weeks before Valentines day, so I figured I could leave up some of the decorations until then! Here's what I came up with! First, I began by making a trip to my local Dollar Tree, and of course my local Thrift Shop! 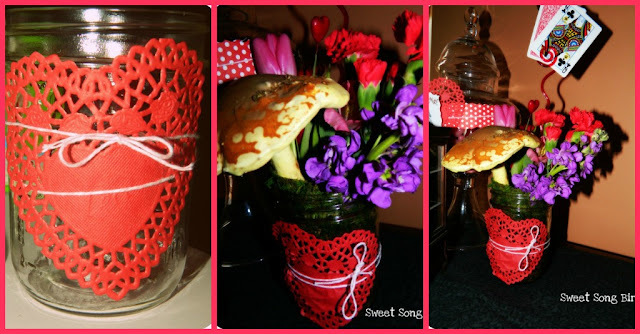 :) I found some heart shaped doilies that I attached to wide mouth masons jar with some pink baker's twine. These would be my flower vases! I dropped them off at my favorite florist with a deck of cards and the words, "adult wonderlandia, moss, and purple/reds". They, of course, nailed my vision! Seriously, I was blown away by what they came up with! Here it is! 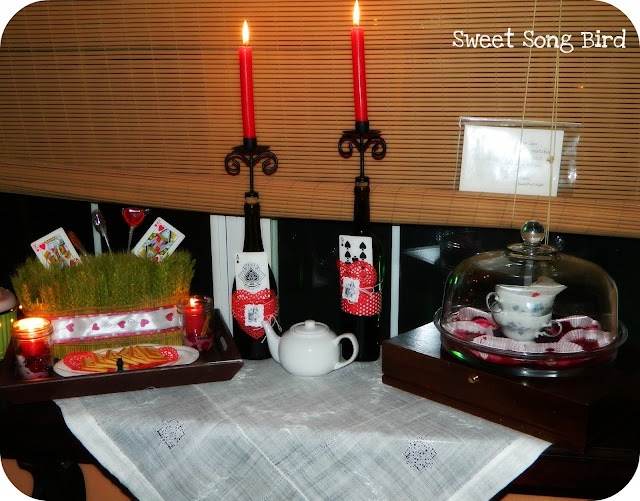 I placed Chessmen cookies and pieces from an actual game around the room along with tea cups and tea pots. 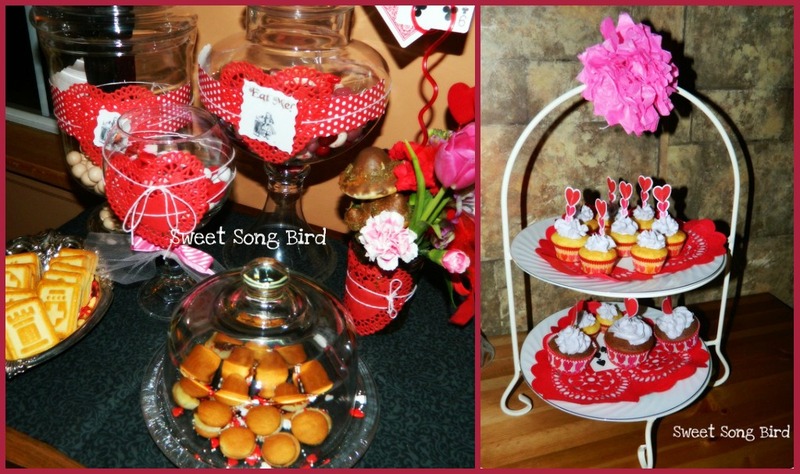 I also played with the "Eat me, Drink me" aspect of the book, making giant and mini treats. 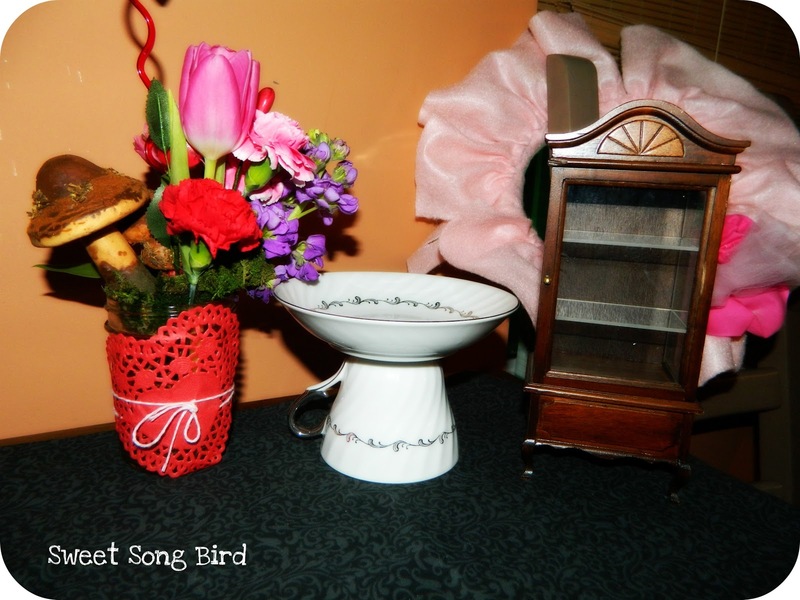 I found this mini china cabinet at my local thrift store. I gave it to Wunkie for her dollhouse after the party! 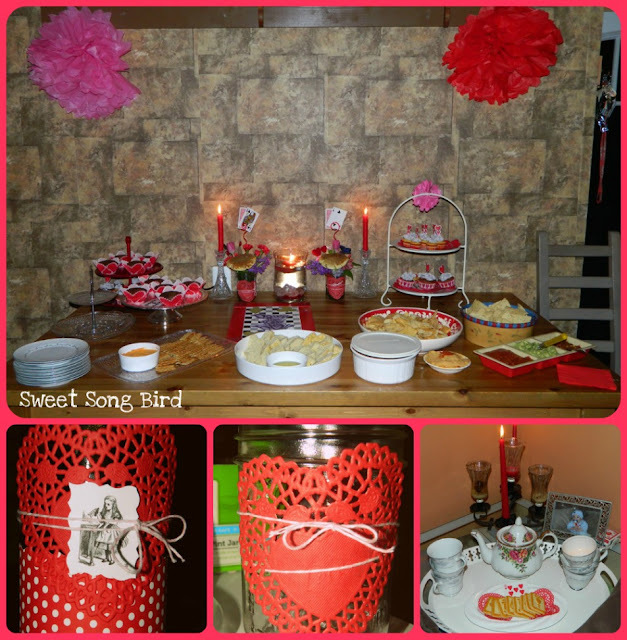 The party was a blast, and I enjoyed getting all the details in order for it! 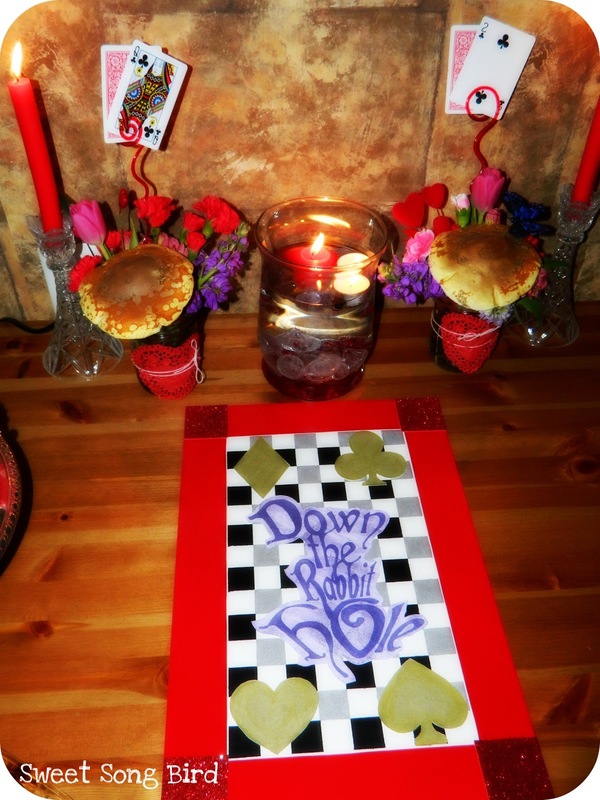 :) Hope I can inspire some of you to have your own "Alice in Wonderland" party!